"Games" over for Sam Claflin, Liam Hemsworth, Evan Ross and Jennifer Lawrence. Miserable, boring and grim, "The Hunger Games: Mockingjay Part 2" ends the franchise on a disappointing note by completing its four-film descent from garishly outrageous charm to dismal videogame tedium. Where 2012's "The Hunger Games" enhanced its dystopian-future foundation with eye-candy outrageousness and bizarrely over-the-top characters, each successive film has been less colorful, less interesting and a lot less fun. Similarly, main character Katniss Everdeen (Jennifer Lawrence) has transformed from a clever, noble and appealingly human victim-turned-victor into a humorlessly mission-driven warrior intent upon killing the evil President Snow (Donald Sutherland), no matter how many hyper-violent death traps she must overcome to do so. Lawrence mostly appears solemn and stone-faced, which actually is preferable to a pair of crying and shouting scenes she overacts. 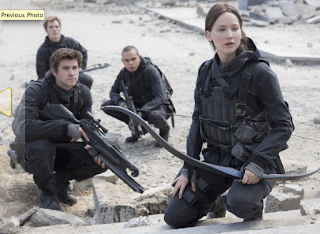 Katniss still cares about her brainwashed fiancé and former "Hunger Games" partner Peeta Mellark (Josh Hutcherson, believably shell-shocked), as well as her wannabe boyfriend and fellow soldier Gale Hawthorne (Liam Hemsworth), but everyone in that love triangle is now damaged, conflicted or distracted. Movie magic largely succeeds in keeping the late Philip Seymour Hoffman in the picture as Plutarch Heavensbee, the rebels' wryly amused propaganda minister. Julianne Moore returns as the coldly calculating rebel head Alma Coin. As former Hunger Games mentor Haymitch Abernathy, Woody Harrelson has little to do beyond looking dour and reading a letter aloud. "Mockingjay Part 2" is not very welcoming to anyone who missed earlier installments, and who won't be aware that the series ever was anything more intriguing than a futuristic war movie. (For comparison, imagine seeing only the dismal "The Matrix Revolutions" without knowing "The Matrix" existed.) Even those who saw the first three "Hunger Games" films may need good memories to recall who's who at times. The smartass bald girl who gives Katniss guff in the rebel infirmary may look familiar, for example, but she never is called by name—so viewers can be forgiven for forgetting she is former Hunger Gamer Johanna Mason (Jena Malone) from District 7. The murky movie looks as bleak as its subject matter, all underground bunkers, urban decay and hopelessly huddled masses. The CGI perils that Katniss and company face when they infiltrate the Capitol, including a swarm of big-toothed albino humanoid creatures, are well executed and unexpectedly lethal, wiping out a surprising portion of the cast. The smart "powerless vs. the powerful" cynicism of the first movie has morphed into a much darker form here. Gale justifies an attack plan that will result in substantial collateral damage by saying, "Even if civilians are mopping floors, they're helping the enemy." Johanna notes that "anybody can kill anybody…you just have to be willing to sacrifice yourself," a lesson that could have come from the ISIS playbook. And Katniss herself is a would-be presidential assassin, after all. At least one of the backstabbing betrayals in the finale feels like a cheat employed solely to wrap up a subplot that deserved a more thoughtful resolution. Also, the set-up for the last-line "zinger" of the movie (taken directly from the Suzanne Collins novel) is embarrassingly contrived.